According to the University of Wisconsin Division of Otolaryngology, approximately 40% of all adults experience dizziness severe enough to report to their doctor. Many of these individuals are older, and also suffer from a fear of falling that keeps them from enjoying basic daily activities that most of us take for granted. The symptoms often come on gradually, over an extended period of time, and go unrecognized until they can no longer be overlooked. It could be lightheadedness, feeling faint, or just “woozy”. 70% of patients are given expensive prescription drugs to treat the symptoms, which help to overcome the initial attack, but will not solve the problem. Just treating the symptoms leaves the door open for the problem to spiral out of control. Fortunately, advances in equipment, diagnosis, and treatment, offer patients more options for relief than just ” take a pill”. 70% of Dizzy Patients Are Given Drugs That Treat The Symptoms… But They Don’t Cure The Problem Or Improve Balance. Up to 40% of all dizziness is caused by inner ear dysfunction which can be easily treated with the right vestibular exercises. Improve balance, and reduce the fear and risk of falling. Reduce or eliminate dizziness caused by movement. This therapy works because your balance system can adapt and compensate for the changes in your body that have brought on the dizziness. For more information, contact us today. 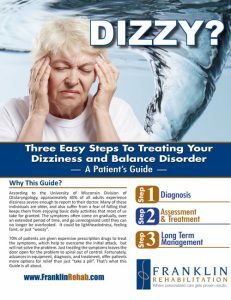 To learn more about balance and dizziness and how vestibular rehab can help, download our Patient’s Guide: “Three Easy Steps To Treating Your Balance and Dizziness Disorder”.